Around half of Key Stage 2 took to the track and field at Saffron Lane in Leicester as part of the annual North West Leicestershire Schools Championships. 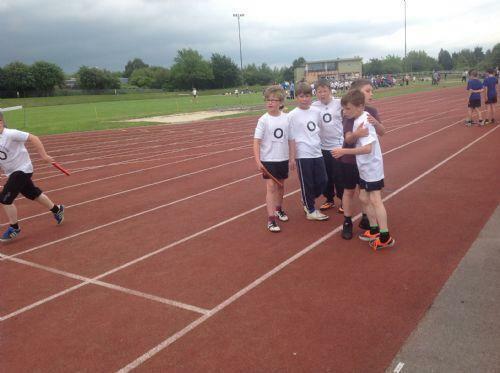 Events such as short sprints- 50m, 60m and 75m were all contested and children were able to progress from their heat through to a final after all of the sprints had finished. We had 2 sprint finalists. During this time, we had athletes out on the field competing in Long Jump and Throwing competitions. Everyone tried extremely hard and we just missed out on a bronze medal by just a few cm. We had children take part in all events on offer to us, all working really hard to achieve their goals. No more so than the enthusiastic 800m runners. They all ran with great pride and confidence and even though it was a tough event, we came away with a bronze medal- Well done Tyler! The preparation whist the 800m for the relays were underway. This can be a long and laborious task, but with all of the relay events filled with an Oakthorpe team, everyone set an amazing example and whilst waiting were incredibly behaved and set a brilliant example. The relays took part and after a long day, we came home. The children were all amazing. Throughout the day they were a complete credit to the school. Well done everyone! Brilliant!